The S.C Department of Natural Resources (SCDNR), Georgia Department of Natural Resources, and US Army Corps of Engineers are conducting a study of striped bass (rockfish) in Thurmond Reservoir (Clark Hill). To accomplish the objectives of the study, a number of striped bass have been implanted with transmitters and externally tagged. All tags have a cash value. How do you report a tag? You do not need to harvest the fish to claim your reward. If you do not harvest the fish, simply clip the external tag from the fish. Do not pull it from the body, carefully release the fish and return the external tag to SCDNR for your reward. If harvesting the fish, please return the external tag and the internal transmitter (which should be visible inside the fish after filleting) so it can be reused. 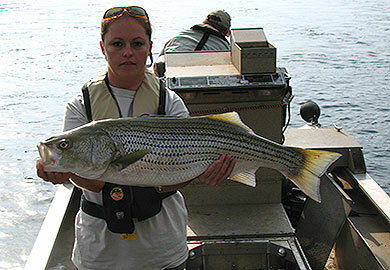 To report a tagged fish, call 1-888-824-7472 or complete and mail the Striped Bass Tagging Study form (Adobe PDF) at http://www.dnr.sc.gov/stripedbass/StripedBassTaggingform.pdf. Report the date your fish was caught, the location, the tag number and total length of the fish (when possible). Measure the striper from the fork tip of the snout with mouth closed to the tip of the tail. When removing the tag, it is important to clip the tag rather than rip it off. For questions, comments you may submit by mail at Jason Bettinger, 1921 Van Boklen Road Eastover, SC 29044, call (80) 353.8232 or email at BettingerJ@dnr.sc.gov. The objectives of the Thurmond Reservoir (Clark Hill) study are to evaluate striped bass use of the Russell tailrace. Evaluate striped bass use of the newly oxygenated area below Modoc, SC and determine angler harvest rates.